We have a dedicated administration team that contact patients from all of our practices to book appointments and offer help and advice, EEHN also organises events throughout the year to improve public awareness of risks and dangers of diabetes and how to have a healthier lifestyle. It is worth noting this particular part of Tower Hamlets has the highest prevalence of Type 2 diabetes. The Network aims to ensure all our Diabetic patients are active in controlling their blood pressure, cholesterol and blood sugar levels by encouraging our diabetic patients to have a healthier lifestyle. In England in 2010, there were approximately 3.1 million people aged 16 or over with diabetes (both diagnosed and undiagnosed). 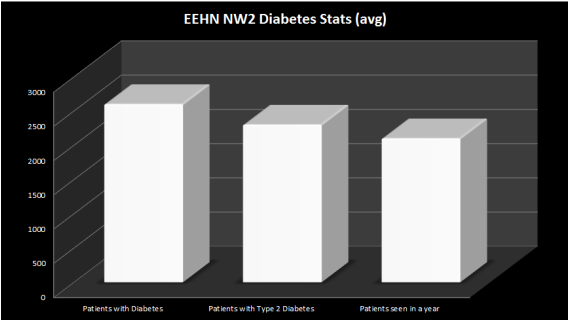 By 2030, this figure is expected to rise to 4.6 million, with 90% of those affected having type 2 diabetes (see below). The charity Diabetes UK estimates that around 850,000 people in England have diabetes, but haven't been diagnosed. Many more people have blood glucose (sugar) levels above the normal range, but not high enough to be diagnosed as having diabetes. This is sometimes known as "pre-diabetes", and if you have it you have a greater risk of developing full-blown diabetes. It's very important for diabetes to be diagnosed as early as possible, because it will get progressively worse if left untreated. You should therefore visit your GP as soon as possible if you have symptoms, which include feeling thirsty, passing urine more often than usual and feeling tired all the time (see the list below for more diabetes symptoms). Type 1 and type 2 diabetes There are two main types of diabetes – type 1 and type 2. Type 2 diabetes occurs when the body doesn't produce enough insulin to function properly, or the body’s cells don't react to insulin. This is known as insulin resistance. Type 2 diabetes is far more common than type 1 diabetes, which occurs when the body doesn't produce any insulin at all. In the UK, about 90% of all adults with diabetes have type 2. Type 1 diabetes usually develops before the age of 40 – often in the teenage years, while type 2 diabetes tends to be diagnosed in older people. Even if you feel healthy, you may have a higher than normal blood glucose level (pre-diabetes) and be at risk of getting the condition. It's therefore important to take preventative measures by making any necessary lifestyle changes, such as eating more healthily, losing weight (if you're overweight) and becoming more physically active. Read more about the lifestyle changes you can make to help treat and prevent type 2 diabetes. Diabetes can cause serious long-term health problems. It's the most common cause of visual impairment and blindness in people of working age. It's also responsible for most cases of kidney failure and lower limb amputation (other than accidents). People with diabetes are up to five times more likely to have cardiovascular disease and stroke than those without diabetes. Read more about the complications of type 2 diabetes. Diabetes can cause a variety of symptoms. The symptoms of type 2 diabetes may not be so obvious, because the condition usually develops slowly over a number of years. It may only be picked up during a routine medical check-up. You should visit your GP as soon as possible if you notice any of the above symptoms. You can also use the diabetes self-assessment tool on this page to find out your risk of developing type 2 diabetes. Causes of type 2 diabetes Insulin is a hormone produced by the pancreas – a large gland located behind the stomach. Insulin controls the amount of glucose in your blood. It moves glucose from the blood into your cells, where it's converted into energy. In type 2 diabetes, not enough insulin is produced to maintain a normal blood glucose level (insulin deficiency), or your body is unable to use the insulin that's produced effectively. This is known as insulin resistance. Read more about the causes of type 2 diabetes. At risk groups Although all adults are at risk of developing type 2 diabetes, a number of groups have a particularly high risk of developing the condition. Treating type 2 diabetes There is no cure for diabetes. However, treatment aims to keep your blood glucose levels as normal as possible, which will control your symptoms and minimise the risk of health problems developing later on. If you're diagnosed with diabetes, you may be referred to a diabetes care team for specialist treatment, or your GP surgery may provide first-line diabetes care. Read more about treating type 2 diabetes. Living with diabetes If you have type 2 diabetes, you will be advised to look after your health very carefully.